While I don’t have much sympathy for her feelings of persecution the idea that Palin’s tasteless rhetoric led to the assassination attempt of Representative Gabrielle Giffords is absurd to say the least. As history shows us these types events usually have more to do with a need for attention than any political ideology. 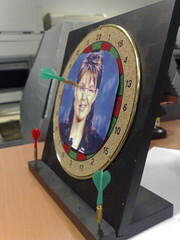 I was initially encouraged, naively perhaps, when Palin’s now infamous hit list started circulating. I had hoped that the tasteless nature of using such violent imagery would incite some civil discourse about the black & white nature of politics in contemporary America. There are many ways to disagree with someone that do not involve painting a target on their face. Not only is it juvenile but it removes all hope of an honest discussion about the issues at hand. Unfortunately people on my side of the political spectrum started making causal links between Palin’s rhetoric & Jared Lee Loughner’s motives. True to form the talking heads on the right would not let themselves be outdone and stooped to calling Loughner a left leaning socialist. It’s a baffling accusation until you look at it the light of our McCarthyesque political dialog. One is hard pressed to find criticism of Obama from the right without some vague or overt reference to the trite threat of socialism. It’s far easier to paint your opponent as some sort of existential threat to freedom than it is to address individual aspects of a policy you don’t agree with. Instead of screaming about death panels lets talk about the challenge of making people who consume health care aware of the costs involved in keeping them healthy. Instead of saying that 9/11 was inside job lets talk about the widely accepted notion that foreign policy shapes how the rest of the world perceives us. Perhaps it’s the idealist (or narcissist) in me but I think that most people in this country don’t perceive their world in stark terms of wrong & right. The reality of politics is much more nuanced and complicated than those on the fringe would have us believe. Unfortunately it’s the fringe that seems to dominate the airwaves and set the tone for how we talk about politics. Perhaps this is part of the reason we have such a low voter turnout in this country. People spend too much time settling arguments between their kids to step into the petty and juvenile fracas that is our political climate. You are currently reading Arizona Shooting : A missed opportunity at Thomas Paine Rants.